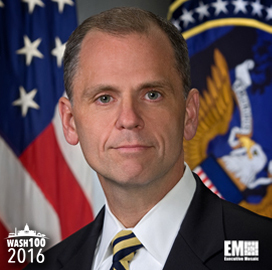 Executive Mosaic is honored to introduce Roger Mason, senior vice president for national security and intelligence at Noblis, for the second year in a row as an inductee into the Wash100 — Executive Mosaic’s annual selection of influential leaders in the government contracting arena. Mason has held his current role at the nonprofit science and technology organization since 2014 and is in charge of its law enforcement, homeland security and defense programs. The two-time Wash100 inductee has worked in the Office of the Director of National Intelligence, the Institute for Defense Analyses and General Dynamics. Mason said earlier this year he believes the Defense Department should adopt biometrics and other commercially-developed technologies to support intelligence operations and keep pace with the private sector. “[When] you think about the ubiquity that biometrics now plays in all of our lives and combine that with the way that we interact with the Internet in terms of our personas, the challenge of anonymity and the challenge of trying to detect other identities becomes much more difficult,” he said. Executive Mosaic congratulates Roger Mason and the Noblis team for their selection to receive this award.